There was a lot of information released by Intel last night with regard to its Architecture Day presentation on Tuesday. I covered most of the official info released by the Intel press team but some things warrant further details, and you will find these small but tasty morsels below. Last night we reported on the information Intel shared about its beefed-up Gen11 iGPUs. However, a few weeks ago there was chitter-chatter that the event would major on information about the Arctic Sound discrete GPUs. 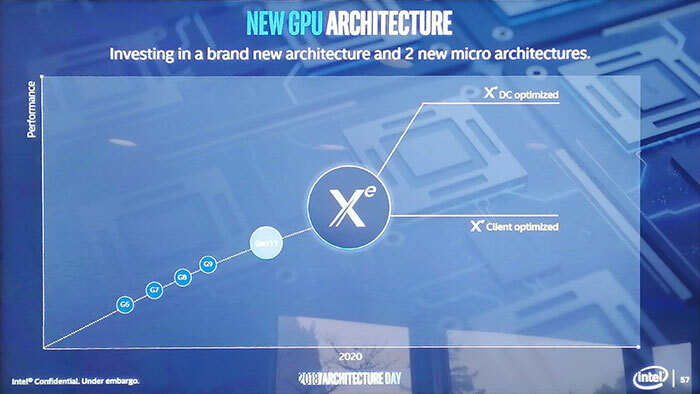 In actuality, details of the upcoming discrete GPU series was scarce, and amounted only to a couple of similar looking slides Raja Koduri shared, showing Intel Xe graphics on a performance timeline. 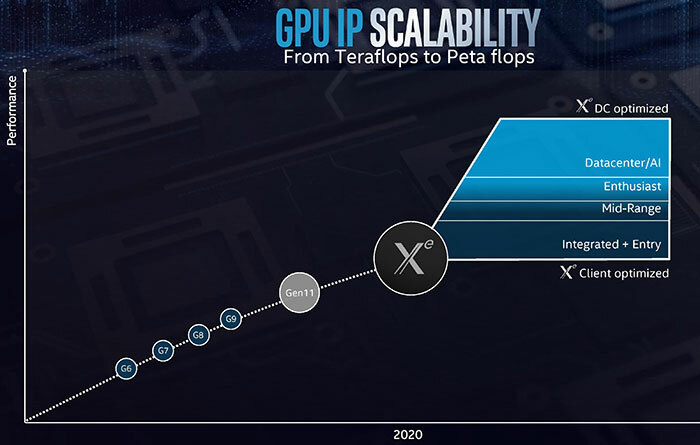 You can see that by 2020, Xe graphics will arrive and be a performance step up from the iGPUs. I note that the Y axis and performance curve doesn't look greatly ambitious. Intel indicates that there will be a spectrum of performance possibilities on offer with Xe, ranging from integrated and entry level solutions to data centre cards. So Xe will become an integrated option too. We expect 2020 will be when the first gen Xe products arrive, as the foundation for future generations. Some Intel Foveros 3D-stacked logic chip samples were shown off during the Architecture Day. 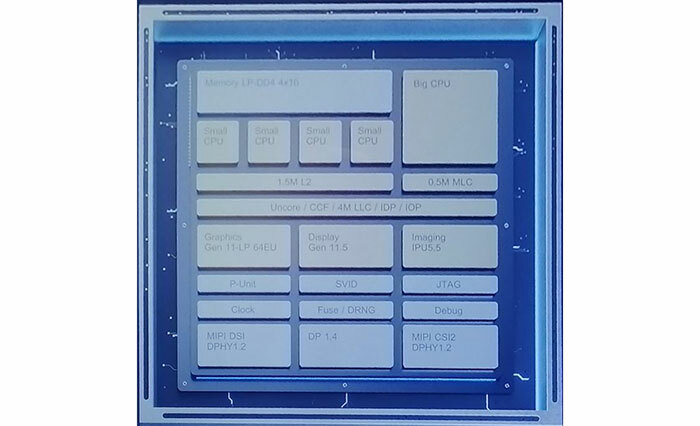 Interestingly Anandtech reported that Intel Foveros will be used for a multi-chip package with a single Sunny Cove core and four Atom cores - likened to Arm's 'big.LITTLE' designs. The sample processor at the event measured 12mm square and just 1mm thick (even though it is a 3D stacked design. A block diagram of an example Foveros Hybrid x86 CPU was a key bit of info shared, and it is embedded below. Above you can see the Foveros sample with various caches, plus uncore components facilitating LPDDR4 connectivity, graphics output and processing (Gen11), plus DP1.4 and so on. 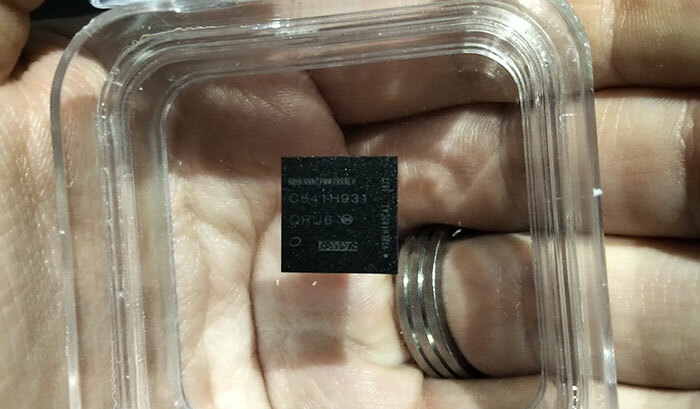 It is reported that the sample Foveros chip could target the sub-7W device market and it also boasts a 2nW standby mode for good battery life. 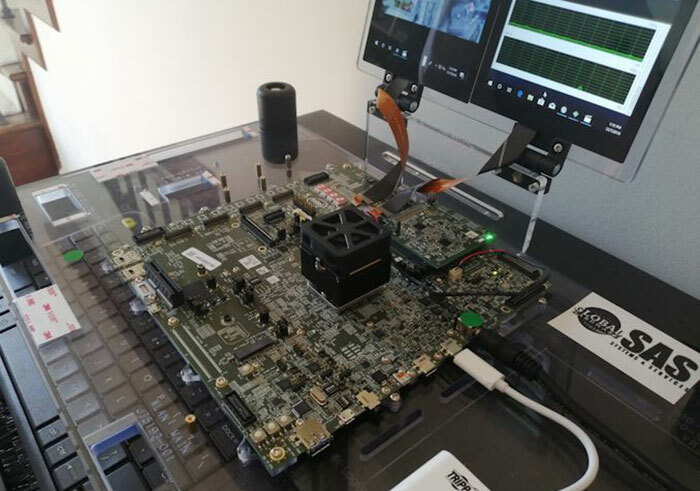 A test system was up and running on a mainboard that sported what appeared to be SIM slots, and is said to be capable of working with PCIe for M.2 as well as UFS storage. Intel's Jim Keller said that lots of new things were being tested with Foveros to see where its sweet spot(s) may lie. Further Foveros designs and applications are likely to emerge over the next couple of years. Wait, so Foveros is not going to be part of their mainstream consumer components? This looks like low power mobile computing so are they not going into chiplets for the next generation to compete with AMD? Interested to more info on Xe line. Not feeling the gpu power at Intel no matter who they've hired. No discrete info tells me NV will rule for even longer. I see the current situation as no different than i740, larrabee, etc. I see no sign of success here vs. NV (or AMD really, you announced NOTHING). Maybe Intel is gunshy after screwing up 10nm so badly, so they make no mentions of any roadmaps for discrete gpus. It's not just the hardware either, you need a DRIVER team that can rival NV/AMD and they have NEVER had one of those (look at igpu driver support over the years, meager at best). If they were going to succeed, we should see monthly or quarterly driver updates from their “great driver team” that doesn't exist. Yet we don't see game ready drivers etc like NV/AMD for their igpu's. Good luck Intel…LOL.